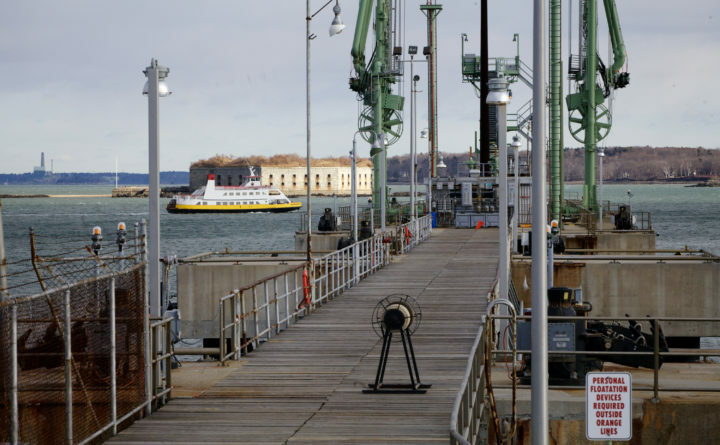 The Peaks Island ferry glides past the Portland Pipeline Corp.’s terminal facility in South Portland in this BDN file photo. Lawyers for the Portland Pipeline Corp. have appealed a federal court decision that effectively blocks it from piping oil south from Canada to Maine. On Wednesday, the company asked the U.S. Court of Appeals for the First Circuit to overturn a decision upholding a South Portland ordinance that bans the bulk loading of crude oil in the city. The appeal comes as the latest development in the company’s yearslong legal battle with the southern Maine city — a court fight that has long been expected to land in front of First Circuit judges in Boston. At the heart of the case, filed in 2015, is South Portland’s so-called Clear Skies ordinance, which serves to prevent the Portland Pipeline Corp. from reversing the flow of the pipeline that’s long carried oil north from the city to refineries in Montreal, Quebec. In August, Judge John Woodcock ruled against the company, which argued that the ordinance breaks constitutional protections of interstate and international commerce. In a written statement, Portland Pipeline Corp. President Thomas Hardison maintained that the ordinance violates the U.S. Constitution and said that “patchwork local regulation” threatens the national and international oil trade. City Manager Scott Morelli called the appeal disappointing in a statement. The city’s lawyer in the case, Jonathan Ettinger of Boston, said he has “every confidence” the First Circuit will uphold the district court decision.